Situated right on the edge of the ocean in the Tuscany region of Italy, Camping Etruria offers a truly luxurious experience for lovers of luxury who want to spend their holiday soaking up the sun. Each mobile home here is fully equipped with all of the latest modern conveniences, while the range of facilities and amenities onsite means that there will never be a dull moment. What makes a camping holiday at Camping Etruria so special? This luxury camping site is located just a few steps from a beautiful sandy beach that is just waiting to be enjoyed. 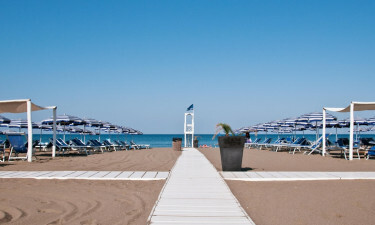 While the beach is the perfect place to unwind for a while, those who like to remain active while they are away will also find that a large number of tournaments and other events are organised on the beach by the staff at Camping Etruria. Water sports equipment such as canoes and pedal boats are also available for hire, and lessons are provided on request. However, guests do not need to leave this leading LUX-Camp to have fun. A kids club is provided for the little ones, packed with activities that the children can enjoy while they make new friends. This will give their parents plenty of time to spend unwinding in the spa, swimming or working up a sweat in the fully-equipped onsite gym. The little ones are sure to have a blast at this nearby amusement park, which offers rides and other types of entertainment options for people of all ages. This is the largest amusement park in the whole of Tuscany and features 5 thrilling roller coasters as well as a water cannon ride, the always-popular Safari Adventure and a 3D cinema, while live shows and performances are provided each day for the whole family to enjoy. Lovers of luxury camping who also like to dine in style will want to make sure that they take the time to enjoy a delicious Tuscan meal in the onsite restaurant. Dishes such as grilled fish, pasta and salads are all prepared fresh to order and feature a Tuscan twist that is sure to get the tastebuds tingling. 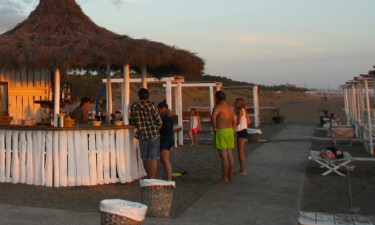 A pizza bar can also be found at the main beach, so guests can grab a quick bite to eat as they soak up the sun, while the onsite bar is a great place to sample locally produced wine and a range of other tipples. The minimart is the perfect place to pick up an assortment of groceries, including fresh local produce that guests can use to create a quick meal in the comfort of their mobile home. Fresh fish is delivered every Friday, while a large selection of wines, cheeses and freshly baked bread is also available to choose from.